More than half a century later, Blacklaw is still waiting for the fortune, but as goalkeeper in the Burnley side which lifted the First Division championship in 1960 his exploits are the stuff of legend. After more than 50 years in Lancashire, it is not surprising Blacklaw now possesses a strong Lancs accent, but he still dropped in the odd Doric gem as he recalled his early days in the Granite City. Born in September 1937, Blacklaw was raised in Sandilands Drive and despite his parents divorcing while he was young, his childhood was a happy one in the company of his younger sister, Ina. He said: "The only ambition I had as a youngster was to follow my dad, Jimmy, into football and, thankfully, I was able to make a living from the game. "All I ever did as a kid was kick a ba' against the wa', and despite the cobbles, me and my pals used to have great fun playing football in the street. "The war started when I was a boy, but it didn't really affect me, apart from the fact I used to get a wee bit worried about my dad, as he was a chief petty officer in the Navy, but he returned home safely. "My mum's name was Isobel, while my dad worked as a ship's carpenter at Hall and Company in Aberdeen and played centre forward for his work's junior football team, as well as for Banks o' Dee. My dad was a really good footballer, an old-fashioned centre forward." Blacklaw was educated at Frederick Street School and his ability soon drew notice. He said: "A Burnley scout had spotted me playing for the Scotland schoolboys' under-15 side, and when they offered me an apprenticeship, I jumped at the chance, despite the fact I hadn't a clue where Burnley was. "In those days, when you were an apprentice footballer, you were just that, an apprentice tradesman who also played football. The club put me through my apprenticeship as a bricklayer." Blacklaw signed for Burnley in 1954, and made his debut in the reserves at the age of 16. 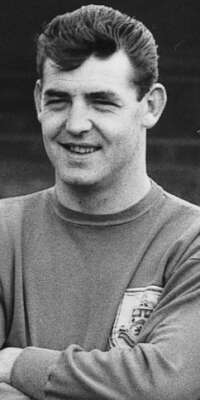 He said: "I got my chance when our first-team goalkeeper, Colin McDonald, who was also the England goalkeeper, broke a leg and I was drafted in to make my Clarets' first-team debut against Cardiff City on December 22, 1956. We won 6-2. "Colin recovered but later suffered a career-threatening injury, so by the 1958-59 season, I had established myself as Burnley's first-team goalkeeper. "I missed only two matches in my first six seasons, one because I was on international duty with Scotland and the other when our manager, Harry Potts, rested the whole team in preparation for our European game in Hamburg the following week. "I didn't agree with the manager's decision and told him I wanted to play, but he was frightened one of us might get injured and miss the Hamburg game. "Harry Potts was a really good manager, while our chairman Bob Lord was a character. He loved the club, but woe betide anyone who said no to him." FOR many years, Burnley struggled in the doldrums of English football, and almost fell out of the league altogether during the 1980s. But it was different during Blacklaw's time at the club. He said: "We had some wonderful players, lads like Ray Pointer, Jimmy Adamson, who later went to manage the club, and, of course, Jimmy McIlroy. "McIlroy was maybe the best of the lot, and just like the rest in a squad of packed full of internationals, he wasn't the least bit big-headed. "We had no real stars, but we worked hard for each other. If any of us was having an off day, everyone else would dig in even deeper to help them through it. We played for each other - that was the secret of our success. "In those days, I suppose we would be playing to average crowds of 40,000 at Turf Moor, while the highlight of my 11 years, and 383 first-team games, was definitely winning the First Division championship in 1960. "We won the First Division by a single point, and when news came through we had actually lifted the title, the celebrations really took off. "It was great, not only for the players and the fans, but for the town. When we were top of the tree, shops would be buzzing on a Saturday afternoon when lads from nearby towns went to the game and their wives and sweethearts went shopping." There were no vast sums of money to be earned, but Blacklaw does not begrudge today's multi-millionaires. He said: "The highest wage I had during my time at Burnley was £60 a week, although I suppose the average man in the street might have been on £25 to £30 per week at the time, so, overall, we were fairly well off. "These days some players are earning £60,000 a week, but times have changed and although it is a lot of money, good luck to them." Burnley's first adventure in the European Cup saw them tackle Stade de Reims and their legendary French internationals Ramond Kopa and Just Fontaine, who was the leading scorer at the 1958 World Cup in Sweden. But the Clarets did not respect reputations and they ran out 2-0 first-leg winners, John Connelly and McIlroy notching the goals. Reims switched the second leg to the Parc de Prince in Paris, the French side winning 3-2 on the night but Burnley progressing 4-3 on aggregate, Robson and Connelly supplying the goals, assisted by some cool defending from Blacklaw and Adamson. In the third round, Burnley entertained German club Hamburg, a side which had dropped only a single point in the first 16 games of the season, in the first leg at Turf Moor. A crowd of 46,237 turned up to see the Clarets win 3-1, thanks to a Brian Pilkington double and Blacklaw's agility and bravery, with one save in particular from Uwe Seeler leaving the German international striker scratching his head in disbelief. The Germans won the second leg 4-1 to end Burnley's first adventure into European football, but six years later, Blacklaw, nearing the end of his career at Turf Moor, was to become a hero once again. He said: "We played in the Inter-City Fairs Cup, now the Uefa Cup, in season 1966-67, although by that time I was competing for the jersey with Harry Thomson. "I played in a bad-tempered first round, first-leg game in Germany, when we drew 1-1 with Stuttgart, before goals at Turf Moor from Ralph Coates and Andy Lochhead took us through to meet Swiss side Lausanne Sports. "The Swiss scored early on, but goals from Coates and Harris gave us a 2-1 interval lead before Andy Lochhead's late header gave us a comfortable 3-1 away win. We won the second-leg 5-0 to set us up for Napoli in the next round. "Amazingly, we won 3-0 in the first leg at Turf Moor, with goals from Ralph Coates, Les Latcham and Andy Lochhead, before heading off for a game which was to become known as the Battle of Naples." BLACKLAW continued: "I was reserve goalkeeper that night, but my replacement, Harry Thomson, had a great game, pulling off save after save to deny the Italians in a 0-0 draw, taking us through 3-0 on aggregate. "At the end of the game, when Harry went to shake hands with Alberto Orlando, the Italian spat in his face and threw a punch at him. "That was enough for me and I leapt to Harry's aid, only to be set upon by about half a dozen Italian players and stadium staff. But I was a big fella and could handle myself, as I had been a boxer in my younger days in Aberdeen. "As I was getting up off the ground, I was able to throw one guy over my shoulder and down a flight of steps, but when I saw a policeman with a gun, I decided to head for the safety of our dressing-room and join the rest of my team-mates. We were later escorted to the airport by an armoured lorry and nine military jeeps." Burnley went on to lose in the quarter-finals to German outfit Eintracht Frankfurt. Had Blacklaw played his football in Scotland, he would undoubtedly have won many more international caps than the three he collected, but, of those, one in particular earned the Aberdonian a place in Scottish football folklore. Blacklaw said: "I played three times for Scotland, once against Norway in Bergen, a game we lost 4-3, a World Cup qualifier, which we lost 3-0 against Italy in Naples, and the other, a historical night in Real Madrid's Bernabeu Stadium against Spain in June 1963. "Spain scored early, but Denis Law levelled in the 15th minute, before Davie Gibson put us 2-1 up. Further goals from Frank McLintock and Davie Wilson gave us a 4-1 lead, but the Spaniards pulled one back before half-time. "In the second half, Willie Henderson ran on to an Ian St John pass to score another before the Saint himself completed the scoring to give us a remarkable 6-2 victory. "The real secret of our success was, once again, we played as a team." That remains Scotland's biggest away win in Europe, a result made even more memorable, as a year later Spain went on to win the European championship. At the end of season 1966-67, Blacklaw moved to nearby Blackburn Rovers, although earlier that term, he had been involved in another incident at Blackburn's Ewood Park when his pugilistic skills again came to his rescue. Burnley were playing Blackburn on New Year's Day, 1966, when a Rovers' fan ran on to the pitch at the Darwen End of Ewood Park and ran straight at the visiting goalkeeper. Blacklaw said: "I saw him coming and decided I was going to get him before he got me. I connected with a straight left, knocked him out cold, and he was stretchered off by the St John's ambulance brigade. "I later joined Blackburn for three seasons and, to be honest, their supporters welcomed me with open arms, but you can imagine the reception I got when I went back to Turf Moor, where I had gone from hero to villain virtually overnight. "I left Blackburn to help out Blackpool, who had been struggling with their goalkeepers, for a short spell, and after that I hung up my gloves." BLACKLAW added: "When I retired, we ran a wee paper shop in Burnley for seven years. I must admit I didn't really mind getting up at 4am to get the papers organised for the delivery lads to pick up later in the morning. "I then became steward at the Burnley Cricket Club, whose ground was right behind the place I'd called home for more than a decade, Turf Moor. "That was before my wife, Sheila, and decided to run our own local pub, the Cross Keys, for several years. "Our daughter, Pauline, still lives near us in Barnoldswick, while our son, Craig, lives only 20 minutes away." Blacklaw still occasionally goes to Turf Moor and said: "I tend to pick my games. I don't really like asking for a ticket these days. "I still love going back to Aberdeen, although it's five years since we've been up as, of course, with the passing of time, there's less and less family and friends to visit. "I've had a very happy life, but I'm still working as a caretaker-handyman at Nelson and Colne College, where the youngsters certainly help to keep me young." He concluded: "I would like to be remembered as a member of the team which took the First Division championship to the town of Burnley for only the second time in the club's history. "Thankfully I still have my health. When the college youngsters wind me up about being an old codger, I always rise to the bait and challenge them to a run down the hill - and I usually win." This article is from the Press and Journal, Aberdeen and was written by Dave Edwards. We have been granted permission by them to reproduce it in its entirety. We would like to thank the Press and Journal, Aberdeen.